Daniel Ricciardo has an uncanny knack for impeccable timing. His Chinese Grand Prix victory was a masterclass in judging the moment - make that moments - to perfection like no one else. Give him a sniff of victory and he nails it with a ruthless efficiency. This was pure killer instinct. The razor-sharp timing rubs off on those around him too. Whether it was nailing his overtaking moves as he surged from sixth to first in just nine laps, the decisive call to stop under the safety car, or even making it out of the pits in time in Q1 to avoid starting from the back of the grid after repairs following a Renault turbo lunching itself in practice, Ricciardo and those around him at Red Bull were bang on the money. Six drivers could have won this race, but it was the Australian who went from the man least likely in the early stages to the top of the podium. Ricciardo did rely on a slice of luck with the timing of the safety car, deployed to tidy up after Pierre Gasly clobbered Toro Rosso team-mate Brendon Hartley at the hairpin as they attempted to swap positions, scattering carbonfibre shards on the track. But fortune favours the brave for a reason. 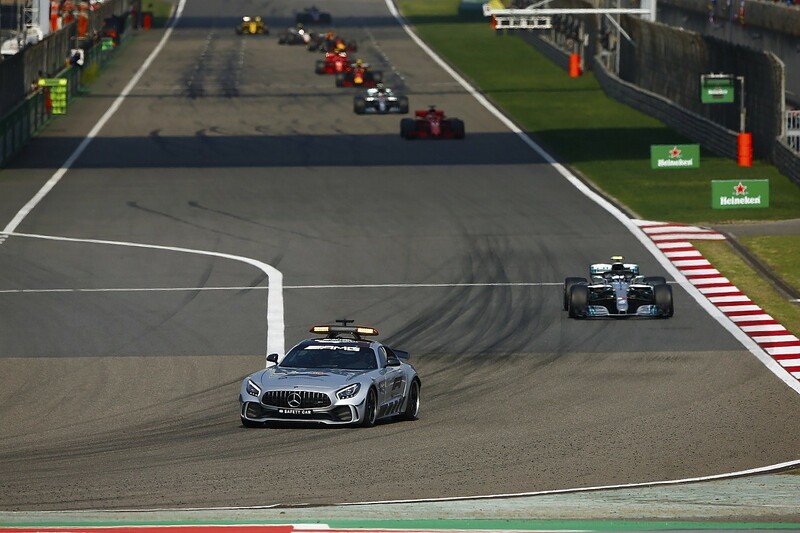 "I could tell that we had the advantage coming in at the safety car and having softs," said Ricciardo of a post-safety car set-up that put him in sixth place for what became a 20-lap sprint race. "Initially it was, 'OK, maybe we can fight for the podium' and at the rate we were going through the field, I could feel the tyres were holding on well, then it was fully set on the win." 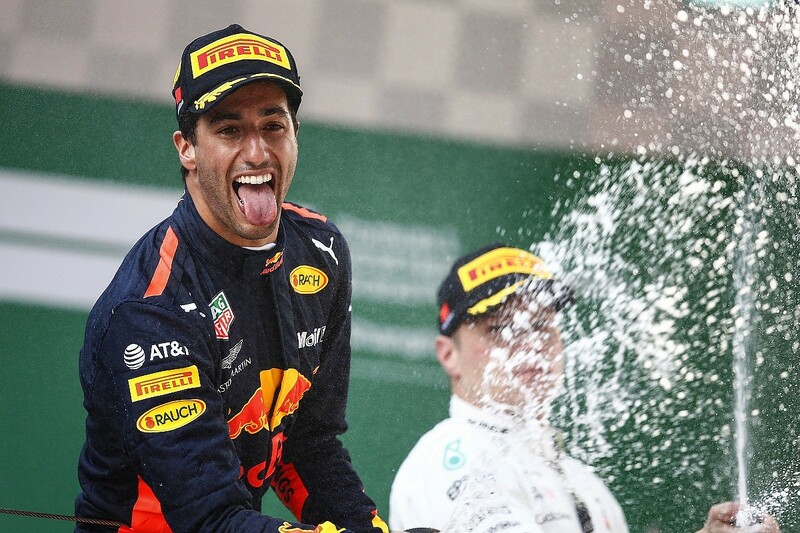 The Ricciardo charge that followed is what the race will be remembered for, but his rivals were left variously frustrated, angry and baffled after opportunities slipped through their fingers. 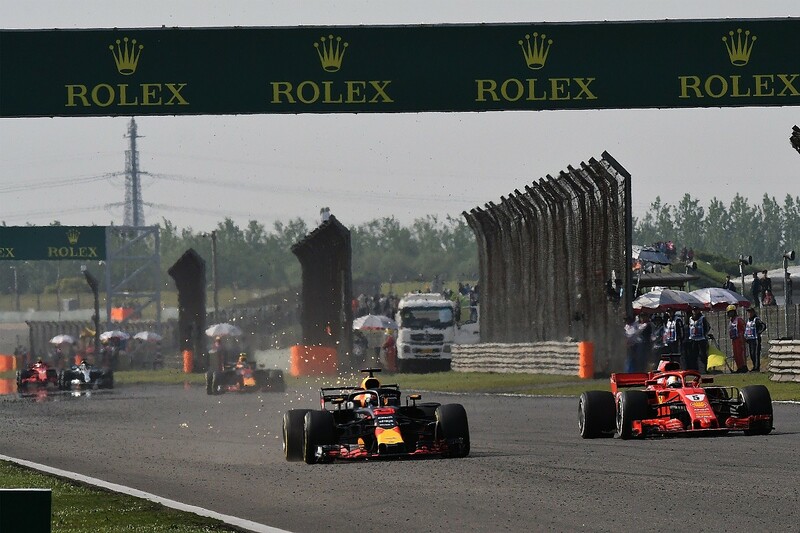 There were three distinct phases of the Chinese Grand Prix, one controlled by each of F1's grandee teams, with the baton only grasped by Red Bull in the final dozen laps. Such a scenario seemed unlikely at the start. 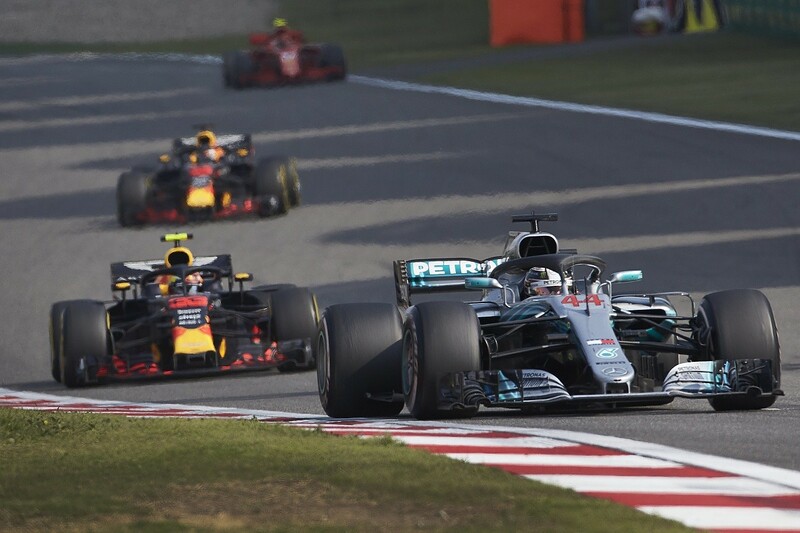 Max Verstappen and Ricciardo started on the third row on ultrasofts, more a survival tyre than a race tyre, and it was Verstappen who made the biggest splash by passing Lewis Hamilton for fourth through Turn 1, then Kimi Raikkonen for third around the outside of the Turn 6 right-hander. But aside from this Red Bull cameo, it was all about soft-shod Ferrari versus Mercedes up front. Sebastian Vettel held the lead from pole position, although fast-starting team-mate Raikkonen had a good enough launch to challenge him on the inside into Turn 1 before dutifully falling in behind. Unfortunately for him, this allowed Valtteri Bottas to go around the outside of him for second. With Raikkonen losing another place to Verstappen, but holding off Hamilton's attack, the order was now set for the first part of the race. Vettel led from Bottas, Verstappen, Raikkonen, Hamilton and Ricciardo. The half-dozen quickly spaced themselves out, with nobody close enough to make a move in the first stint and Ricciardo more than 16 seconds behind by the time he and Verstappen were called in for a Red Bull double-stack pitstop. They had extended their ultrasoft stint to sufficient length to consider a one-stop race and were in a position to become a factor later, but were yet to join the lead battle. In Bahrain last week, Bottas and Mercedes wanted to undercut Vettel at the first round of pitstops, only to be covered by Ferrari. This time, Bottas's undercut wasn't blocked and he dived into the pits at the end of lap 19 of 56 while 3.182 seconds behind Vettel. A combination of a decent in-lap, the quickest pitstop of the race and a storming out-lap on which he set the fastest second and third sector of the day so far allowed Bottas to take the lead when Vettel stopped a lap later. "We knew that it was possible with this kind of gap if you get everything perfect," said Bottas. "If you can switch on the tyres quickly, it's possible. That's why we stopped at this point, it was perfect timing." Both were now on the medium Pirellis, but Ferrari decided to chuck a Raikkonen-shaped curveball at Mercedes by extending his first stint. 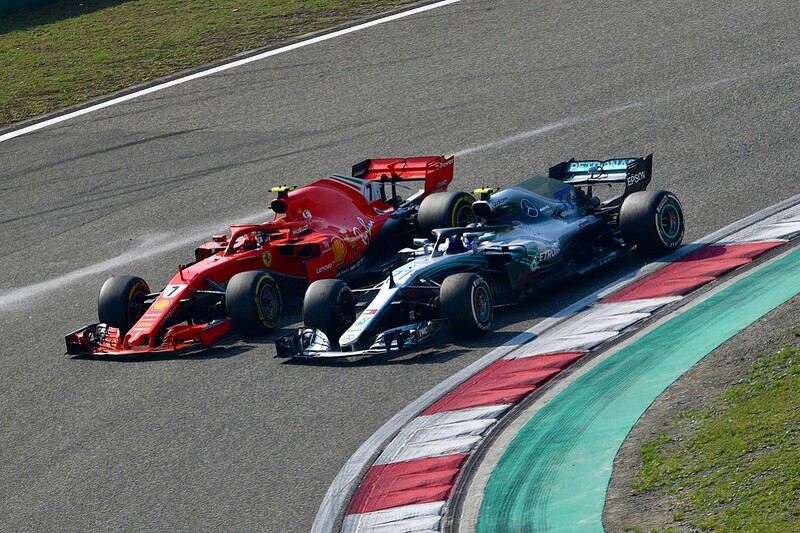 This effectively sacrificed Raikkonen, but it briefly helped to back up Bottas into Vettel - albeit not by enough to justify compromising the second Ferrari driver's race. Bottas dispatched Raikkonen by going around the outside into Turn 1 on lap 27, completing the move into the Turn 2 left-hander. 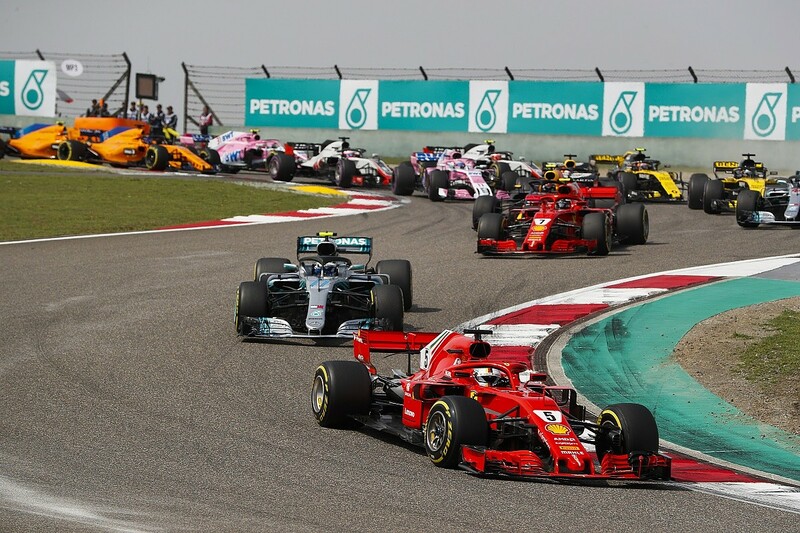 Raikkonen, dutifully, made a nuisance of himself in a final attempt to distract the Mercedes driver on the following straight before allowing Vettel past and heading straight for the pits for the inevitable slump to sixth. The stage was seemingly set for a duel to the finish between Bottas and Vettel, while Verstappen, Hamilton and Ricciardo tried to cruise up to join the duo. But that race never happened thanks to the Toro Rosso clash. Though Hartley spun and rejoined, thanks to debris on the track the safety car was deployed after a short delay. Before the tangle between its B-team drivers, Red Bull was thinking about splitting strategies with Verstappen probably running to the end on mediums and Ricciardo potentially taking a more aggressive two-stop approach. When the safety car was deployed, Bottas and Vettel, split by a second, were already in the final corner and could not dive into the pits. Verstappen, Hamilton and Ricciardo were running in a group at the hairpin but only the Red Bulls drivers were called in. 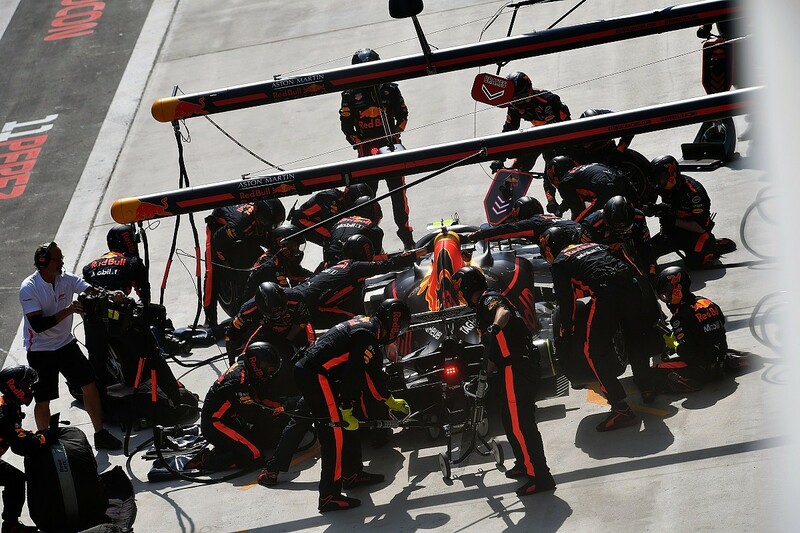 "It was a really late call, and also harder for Max to get into the pitlane because he was further up the road than Daniel," said Red Bull team principal Christian Horner. "Both got in, we got them turned around and none of the other leading pack elected to do that. "Whilst we conceded a place to Hamilton with Verstappen and Raikkonen with Ricciardo, we were on a better tyre for the rest of the grand prix. At the restart, the guys were able to get into it pretty quickly." Verstappen and Ricciardo took the restart with 21 laps to go running fourth and sixth respectively, but crucially with a tyre-life advantage. It seemed such an obvious move. "We thought that track position would be more beneficial," said Mercedes team boss Toto Wolff. "You could see in the first stint there was no overtaking. Lewis's tyre was a medium at that stage, with barely 10 laps on. Our calculation predicted that a medium would last until the end, and putting on a new soft we thought wouldn't give you such a performance advantage. [It was] much more than we expected. "Looking back, it would have been the right strategy to go for the second soft, but nobody in the team, including myself, thought that it was the right thing to do." There certainly was no evidence from the race to date to suggest that passing would be that easy with the offset between the fresh softs of the Red Bulls and the 13-lap older mediums Hamilton was on - because that situation hadn't yet arisen. The difference between racing in a cat-and-mouse game in the first stint and later in the race is significant, and Mercedes should have applied a bit more old-fashioned racing nous to fill the holes in the data, especially with track temperatures much higher in the race than during practice and increasing thermal degradation. Although for the same reason, there were legitimate concerns about keeping the rear tyre temperatures under control on the softs Hamilton could have switched to. "I stayed out and initially it was, 'OK, this is good, I'm right behind Seb and maybe I have a chance, they're both on the same length of tyre so maybe there's a little bit of a battle we can have to the end'," said Hamilton of the situation. "And I look in my mirrors and the Red Bulls are behind me on brand new tyres. So it was, 'How the hell did that happen?'. I thought they would be further back with a stop, so I knew they were going to come." Perhaps there was some nervousness after track position disadvantages transformed into defeats in the first two races of the season? Whatever the reason, for the third race in a row, a strategic mistake had been made and Hamilton was dead in the water. The strategy tools used by Mercedes certainly failed to introduce the Ricciardo factor to its equations. The pace advantage of fresher rubber was significant, but with every lap the difference to older tyres reduces. In short, Ricciardo had to get on with it. While Bottas pulled a gap of almost a second over Vettel at the restart, all eyes were on the Red Bulls. Ricciardo made a mediocre restart, but held position and started to reel Raikkonen in rapidly. On lap 37, 19 from the end, he took the position with a move up the inside into the hairpin. Fifth. Verstappen was closer to victory, but on lap 39 he attacked third-placed Hamilton and his attempt to go around the outside in the fast Turn 7 left-hander led to his car squirming on the wide line and being spat off the track. It was enough to let Ricciardo past, a race-losing mistake. Fourth. Ricciardo made a much better job of passing Hamilton, diving inside the Mercedes at the hairpin a lap after Verstappen's off. It was a stunning move, one of those Ricciardo specials that seemed to come too late to have any chance of coming off. Third. Two laps later, he blasted pass Vettel on the back straight in the least spectacular of his four key passes. Second. That left Bottas exposed, and on lap 45 Ricciardo mugged Bottas with a thrilling dive up the inside into the Turn 6 hairpin. Bottas tried to defend, but couldn't cover it and Ricciardo somehow managed to get the car stopped in time to get around the corner. First. "I had the pace over all the guys that I got ahead of, but you still don't want to sit behind for too long," said Ricciardo. "I saw Valtteri defend but I was kind of committed already from Turn 3 that I was going to try. "It was close, but I would say fair, and it's cool when you go wheel-to-wheel. It makes it a bit sweeter than just cruising past on the straight." Bottas perhaps could have defended more aggressively, but it was always inevitable Ricciardo would get ahead given he had over a second per lap in hand. "He was closing lap after lap with pretty big gains, so there was not much to do," said Bottas. "I tried to defend but ultimately, with the better tyres, he could really brake quite a lot later and got inside. It was just a matter of time, with the pace he was going." The key to Ricciardo's victory was making these passes decisively and cleanly. The advantage of fresh rubber reduces as the stint lengthens, and by getting on with it Ricciardo maximised his advantage. Verstappen squandered his chance. Having passed Hamilton, he compounded his Turn 7 blunder by making a terrible attempt to pass Vettel for second at the hairpin. Vettel went deep, but Verstappen carried in too much speed and hit the right-rear of the Ferrari. 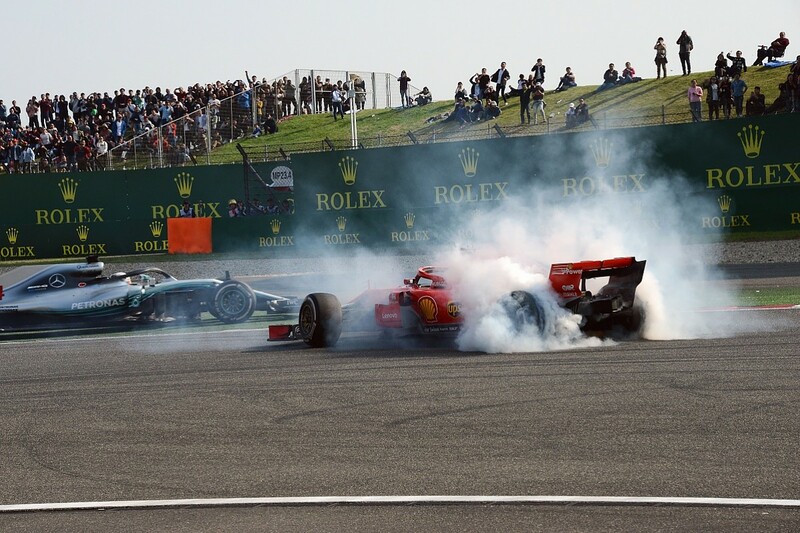 The resulting damage meant Vettel slid to eighth by the finish, with the final ignominy being muscled aside by Fernando Alonso through Turns 1 and 2 late on. Vettel was already unhappy by the timing of the safety car, but there are always winners and losers when races are neutralised. The assault by Verstappen was another matter, and the Dutchman's apologetic demeanour after the race shows just how obvious a blunder it was. The clash rightly earned Verstappen a 10-second penalty, which was applied post-race, and after repassing Hamilton (who knew Verstappen had a penalty) unopposed, the Red Bull driver dropped back to fifth at the chequered flag. It was touch and go with the inspired Nico Hulkenberg too, who was just six tenths behind on the adjusted result. Verstappen's second moment of madness allowed Raikkonen to take third, the good fortune just reward for Ferrari compromising his strategy. He was close enough to Bottas to give the Mercedes driver something to think about, too, finishing within a second. Both of the drivers who shared the podium with Ricciardo had good reason to rue their misfortune, as did those frontrunners who didn't even make it to the rostrum. But races like these always pay dividends to those who play their cards right with perfect timing. And Ricciardo is the right man for such circumstances. As the man himself pointed out, while he doesn't win that many grands prix, when he does they tend to be thrillers. The time is right for Ricciardo to be in a title-winning car.